The Spoke’N’Word Festival brings together artists from Austria, the Czech Republic, Denmark, Estonia, France, Germany, Hungary, Poland, Portugal, Romania, Switzerland and Denmark, which is presented by Sara Hauge for this year’s edition. The participants performs live poetry slams. The theme of this year’s festival is WE HAVE A UNIVERSE HERE, implying of course, that the stage at DZiK will create its own little universe of words. Prior to the performance on Saturday night, the eleven performing artists will conduct a two-day workshop stimulating knowledge sharing and mutual inspiration. 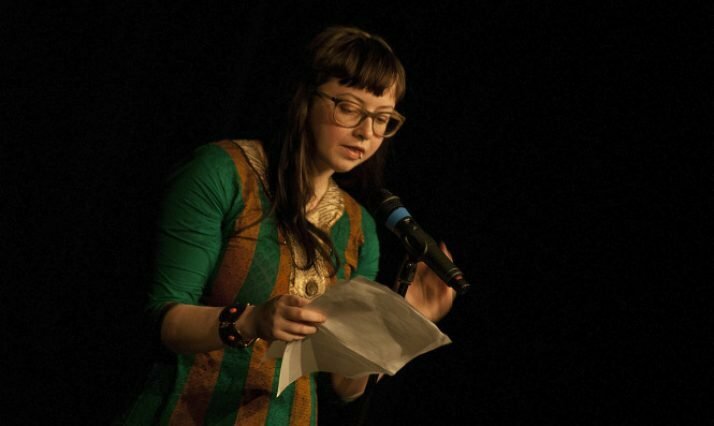 In her work as a poet, Hauge’s main focus is on spoken word and poetry slam. She won Danish Championships in poetry slam in both 2014 and 2018, and she won the Copenhagen Championship in 2016 and 2018. One of the persistent topics of her poetry is mental illness, which she helps to make less of a tabu. In 2015, Sara Hauge’s collection of poems Anerkend at vi er dig (Accept that we are you) was published. In this personal text, Hauge welcomes the reader to experience the world of schizophrenia, finding beautiful poetry and terrifying truths in the depths of the human mind. Organizers: EUNIC Warszawa, Austrian Forum of Culture, Czech Center, Danish Cultural Institute, Embassy of the Republic of Estonia, French Institute, Goethe Institute, Camoes Institute, Romanian Institute, Embassy of Switzerland, European Commission Representation in Poland.